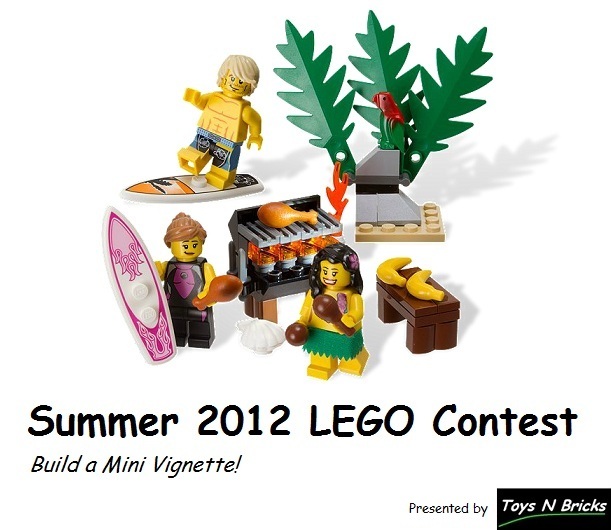 Our LEGO Summer 2012 Contest is now here! This Summer, the challenge is to build a small vignette using 10x10 plate for the footprint with no more than 300 pieces. If you have a question regarding this contest, please post it here. You will have lots of time for this contest as it will run for 2 months. Use your time wisely to design one of the best looking summer vignettes! Looking for pieces to build your creation? Hoosier Brick has a huge selection of parts and has also partnered with us where you can get 15% off on all parts orders when you mention this contest. Deadline: Contest ends on August 31st at 21:00 PST (September 1st - 0:00 EST). *All entries that fails to meet the above guidelines by the deadline will be disqualified. The Second Place Winner will receive a $50 Bricklink Gift Certificate that can be used for anything at Hoosier Brick. The Third Place winner will also receive free worldwide shipping so its a true $50 gift. Voucher will be good for 1 year after issue. Bricklink account required. Toys N Bricks reserves the right to modify or change the rules at anytime. By accepting the prize, you have read and understood the rules and our basic contests & prizes rules. A LEGO Fan Community. Like us on FaceBook and follow us on Twitter! Big thanks to Hoosier Brick! SO COOL. Can't wait. You may want to clarify the max number of pieces allowed. Description states no more than 300 pieces, but the contest rules state maximum of 350 pieces. Does the entry have to use a collectable minifigure? Does it have to use a minifigure at all? unclad wrote: You may want to clarify the max number of pieces allowed. Description states no more than 300 pieces, but the contest rules state maximum of 350 pieces. It is 300 pieces. Thank you. crazybirdman wrote: Does the entry have to use a collectable minifigure? Does it have to use a minifigure at all? No, it is up to you whether or not you want to include minifigures. The more winners the better? I prefer 3 prizes instead of 2. Just my 2 cents. Legobrandon wrote: The more winners the better? I prefer 3 prizes instead of 2. Just my 2 cents. I third, although I like the option (if you win 1st place) to pass and take a 'lesser' prize. Someone may already have the 1st place set, and want to pass on it. This is just an update from Hoosier Brick. We will be closed for vacation from July 10-24(part of the reason this contest runs til end of August). We will be taking our summer road trip visiting various Baseball Stadiums/Amusement Parks/LEGO stores. This years itinerary takes us through Chicago, Milwaukee, Minneapolis, Kansas City, and St Louis with all points in between! If you guys can think of anything that is a MUST DO in one of these cities please PM me. I love a local point of view on the best a city has to offer! The store will have a bypass password setup so you can visit the store and place an order for immediate processing upon return. The password will be "vacation" without the quotation marks. You can still contact me via email, but response time will be more in the 24 hour range as opposed to a few hours normally. If you want your order shipped out by the morning of July 11 you must be paid by July 9. Any questions or comments please feel free to contact me here or on Bricklink.com! crazybirdman wrote: I third, although I like the option (if you win 1st place) to pass and take a 'lesser' prize. Someone may already have the 1st place set, and want to pass on it. If you have a minifig in your entry, does it count as part of the 300 pieces? I'm completely new here, so please excuse the naivety of my questions; I assume the vignette has to be summer themed? And does the baseplate count towards the 300 pieces? Vacation is over :( But that means the store Hoosier Brick is back open for business! Remember to mention the TnB contest to receive your discount! The order is good for all parts, not just the ones used for this contest! I will be adding inventory that I collected over my trip from various locations so check back daily for new inventory starting tomorrow! Sounds like a fun contest! Thanks for hosting it, I'll be sure to enter. I was wondering, would minor overhang(s) be permitted, for example a tree's leaves and branches or minifigure accessories? In these cases they would extend perhaps 1 or 2 studs over the base. Thanks in advance. Uno Brick wrote: I was wondering, would minor overhang(s) be permitted, for example a tree's leaves and branches or minifigure accessories? In these cases they would extend perhaps 1 or 2 studs over the base. Thanks in advance. As long as the majority of the vig is inside the 10x10 base a little overhang is fine. Is that supposed to be 10x10 studs? For some reason I read that as 10x10 inches which is a 32x32 stud plate! I was thinking... how would you fit 300 pieces onto a 10stud plate, it must be 32x32! DOH!